One of the great joys of bike touring is that when you wake up in the morning, you can't possibly imagine what might happen during the course of the day. Today provides a perfect example. The day started like any other. Get up. Pack up. Have breakfast. Hit the road. Continue to move the pedals round'n'round until the odometer tells you that you have reached your destination. We have plans to meet up with some people tomorrow, and we're a little further along our route than we thought we'd be. So, we knew that today would be a low mileage day. 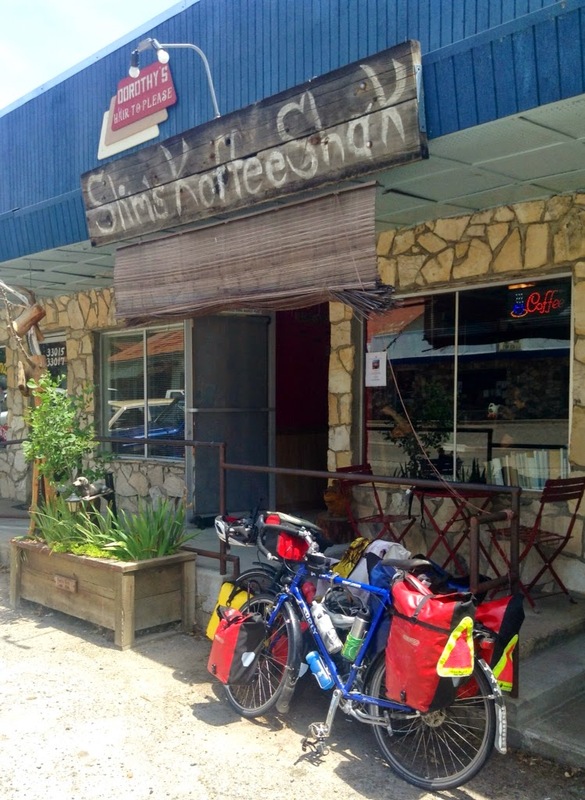 We rode a few miles into the town of North Fork, where we camped out for a few hours at Slim's Koffee Shak. The adorable Slim's Koffee Shak, in North Fork, CA. We arrived around 8:30am and ordered some coffee beverages. 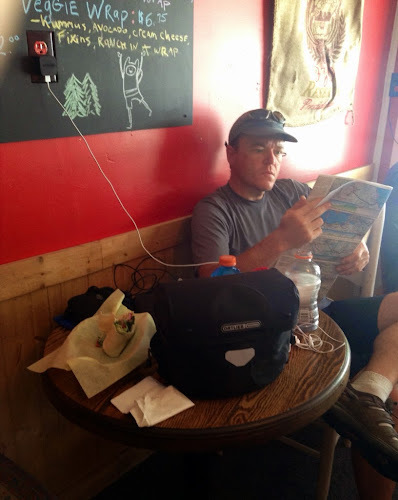 We plugged in our devices to recharge them, while we took care of some wifi business. We reviewed our route for the next few days. Around 9:30am, Alex and I asked each other if it was too early for lunch. We both agreed that it wasn't too early, and so lunch we had. half-eaten veggie wrap to snap a photo. 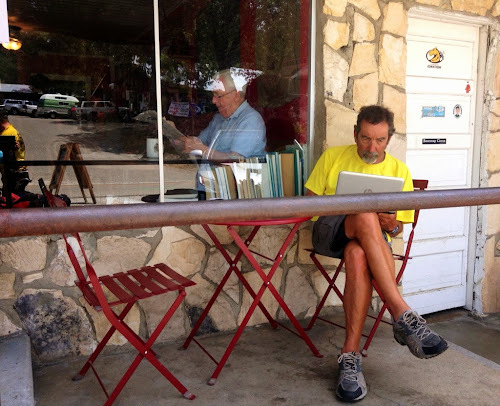 A little while later, Randy strolled up to the Koffee Shak. Randy was hungry for a hotel tomorrow night, and so he jumped online to book a room in Oakhurst. Randy books a hotel room. From North Fork, we rode the final ten miles together to our campground. We stopped along the route to capture some video on Alex's GoPro. The videoing was a true test of Randy's sportsmanship, and Randy passed with flying colors; he was super-duper patient as we captured a couple of different videos along the route. As we were riding along the perfectly lovely lakeside road, Randy proclaimed, "We are the three luckiest people in the world." I didn't doubt that. And our luck was just about to increase. Tenfold! Our campground for the night, Forks Campgrounds, is on the shore of Bass Lake. Given that this is Memorial Day weekend, we figured the lake and its surrounding campgrounds would be teeming with people. We figured correctly. as we travelled further north along the lakeshore. When we arrived at the campground, we were told by the host that we'd need to ride two more miles up the road to inquire at the main office whether there were any vacancies. While biking four miles round-trip isn't the end-of-the-world, it certainly is a heck of a lot easier to drive those miles than it is to bike those miles. We asked the host if he might be able to call the office for us...just as Michelle walked up. Disguised in a brown-colored recreational uniform, I'm convinced that Michelle is an angel; she undoubtedly sports some wings and a halo beneath her uniform. 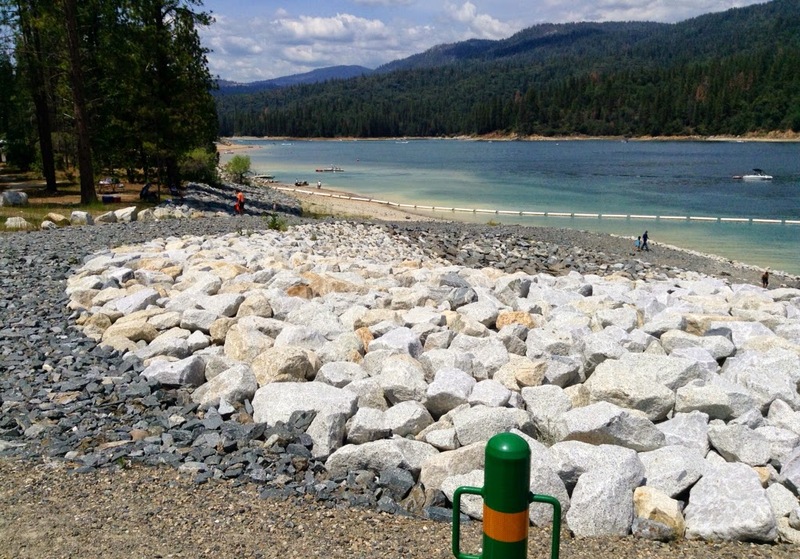 Michelle manages this campground, as well as a number of other campgrounds in the area. After learning of our ride, she suggested that we pitch our tents in the space next door, where her RV is parked. Sweetness! 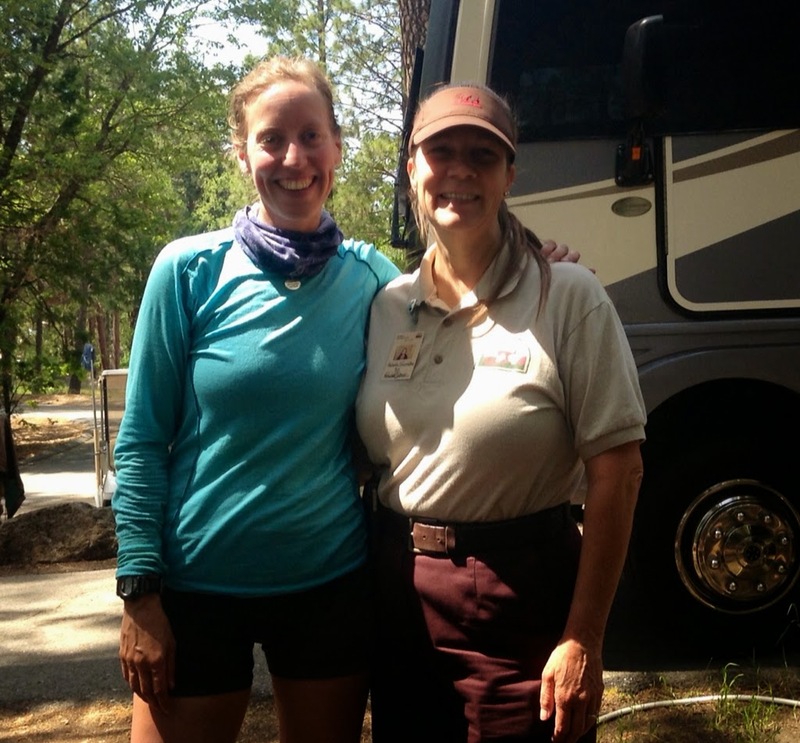 Me and Michelle, the campground manager who made our day. 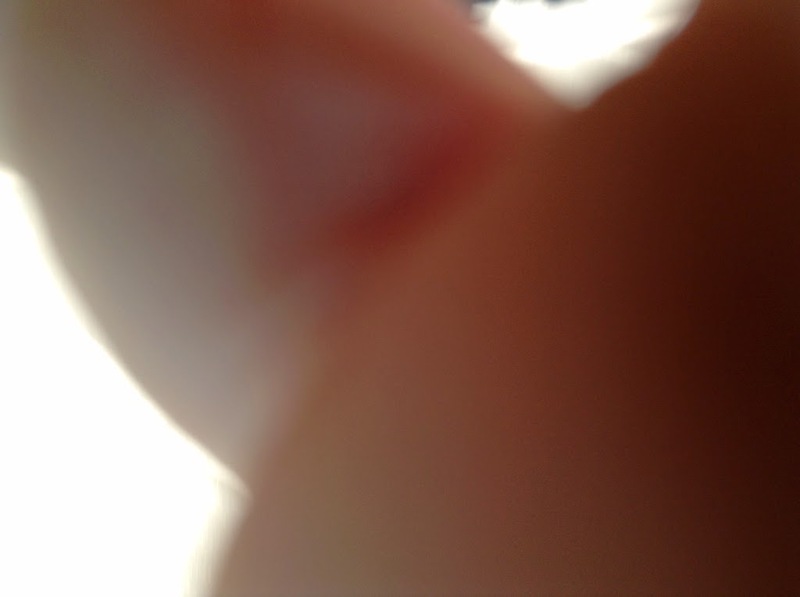 A close-up of Randy's fingers, his first attempt at photographing me and Michelle. AND that we could take a shower in her RV! Oh my god! Hearing that was heavenly music to my ears! My last shower was five days ago. I knew I was getting a bit too ripe when I woke up this morning, and I could smell my stink from within my tent. What's worse is that I didn't have the rainfly on my tent last night, and so the breeze was free to blow my stink away through the tent's mesh netting. When the breeze fails to blow away my stink, I can only imagine that I must be riding in the fast-lane to becoming a hygienic hazard. Michelle's shower felt amazing! It was my first time showering in an RV, so I can cross that off my bucket list. The hot water in the shower was limited, and so it was one of those turn-the-water-on-to-rinse and turn-the-water-off-to-get-sudsy type of ordeals, but it still felt marvelous! We were fortunate to have Michelle join us for dinner at the restaurant next door. We enjoyed learning about the joys and challenges of managing campgrounds. Me, Alex, Michelle, and Randy at dinner. Michelle asked how we met each other. We explained that Alex and I had been traveling together since the beginning of the trip, and that we had met Randy in Sequoia National Park a few days prior. I love how Randy explained our relationship: "We've been lifelong friends for four days." We continue to be amazed at the generosity of strangers that we have met along our ride. Michelle is one of those people who has opened her heart to us and made us feel at home. One of the great things about traveling by bicycle is how quickly strangers become lifelong friends. That applies to Randy. And Michelle. And all the other folks we've met along the way who have helped us. Or expressed interest in our trip. Or who have given us thumbs-up as they've passed us in their cars. 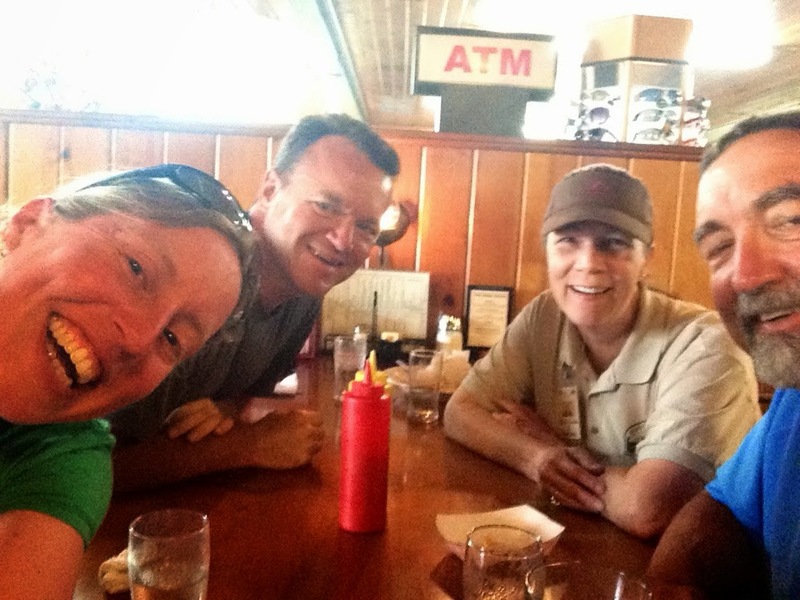 Yup, bicycle touring is about lifelong friends. And lifelong memories. What a lovely story.... You better get your showering skills straightened out if you want to the world travel... Be prepared to take cold shower, hot shower, water ending in the middle of the shower shower, dripping water shower, a bucket shower or sometimes no shower..